These traditional German cake recipes were used by Grandma to make delicious dessert cakes for her large family. Her nine kids ate plenty of cake, especially when it was this good, so she sometimes doubled the recipes! 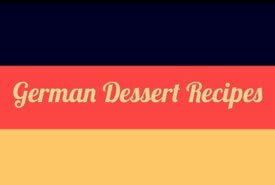 Why not try one of these German dessert cakes today? They're easily made and so delicious. Before making this German cake recipe, preheat your oven to 350°F. Grease and flour a 10-inch tube pan and set aside. Beat the butter with sugar and extracts until light and fluffy. Beat in the eggs first and then add the milk. In a bowl, with a wire whisk stir together the flour, baking powder, and salt. Beat the dry mixture into the creamed mixture until combined. Remove half of the batter to a bowl and stir in the cocoa and oil into the batter in the mixer bowl. Alternate large globs of the white and chocolate batter around the tube pan, then gently swirl the two batters with a spatula. Bake in moderate oven for about 50 to 60 minutes (maybe more, depending on your oven) or until it pulls away slightly from the sides of pan and a wire tester inserted in the center comes out clean. Transfer cake to a wire rack and cool completely before serving. 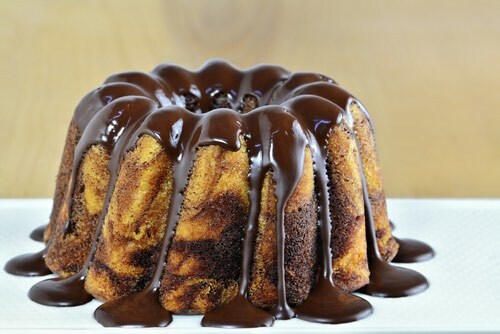 Take some melted bittersweet chocolate and drizzle it over the top to decorate. True, this isn't a German cake recipe, but these buns with their sweet filling taste almost as good as cake and are excellent for serving at tea time as a dessert with homemade preserves. 4 cups sifted flour, 1 small teaspoon salt, 1 cup white sugar, 1/2 cup butter, 1/2 cup lard, 1 egg (well beaten). Mix up with milk and water, half each. Add 1 teaspoon soda, 2 teaspoons cream of tartar. Filling: 1 egg, 1 cup brown sugar, 1/2 cup flour; mix. Roll out your buns and spread on the filling. Then roll up and cut off in slices. Bake. Do not put the buns too close together, as they spread. Make three thin layer cakes from a good recipe, and put them together with a stiff filling of whipped cream, sweetened and flavored with strawberry juice. Cover the top and sides with icing of the same flavor, both pink and daintily made. Serve, sliced, for dessert. Decorate the top with candied cherries and leaves of citron, cut thin, in a wreath. This is a good and very pretty cake, though called a tart. In Germany, it's customary to shake some cinnamon sugar all over this kind of cake, as soon as it's turned out of the mold. Beat 10 ounces of butter with 1/4 pound sugar, which has mixed with the zest of a lemon and a little nutmeg. Add 4 ounces of flour and 2 eggs, well beaten. Work these well together, add 3/4 pound more flour, 2 whole eggs, and the yolks of 4 one by one. Add finally 3/4 ounce of yeast, dissolved in 1/2 cup of milk. Butter a mold, line it with chopped nuts, and pour in and bake 1-3/4 hours. Turn out, serve in slices, with cream sauce or melted jam. Sift 3 ounces of flour, add a pinch of salt, the grated rind and juice of a lemon, yolks of 5 eggs, and enough water to make a paste. Let this stand 1/2 hour. Roll it out thin, cut into strips, twist these like curls and fry in hot fat. Dust them with sugar and serve hot, with a sauce of melted grape preserves. May be cut in squares instead. Mix 2 eggs, 6 ounces flour, 2 ounces sugar, and 1 ounce of anise seed to a paste. Cut into long rolls, twist them, glaze with yolk of an egg, and bake until brown. For afternoon tea or lunch. Boil some prunes until tender. Remove the kernels and mash the prunes well. Mix with sugar, cinnamon, and lemon juice to taste. Make a rich biscuit dough, roll out and place on a well-buttered baking pan. Fill with the prunes and let bake until done. Serve cold. Mix 1/2 pound flour with 1/2 pound of fresh butter; add 1/4 pound of sugar, 1 egg and 1 beaten yolk, 1 tablespoonful of sweet cream, and some grated lemon peel. Mix thoroughly and mold the dough into small wreaths; brush the top with the yolk of an egg and sprinkle with powdered sweet almonds. Lay in a well-buttered baking tin and bake until a deep yellow. Ingredients: One pound of flour, three-quarters of a pound of butter, six ounces of sugar, one egg, half a cupful of rum. 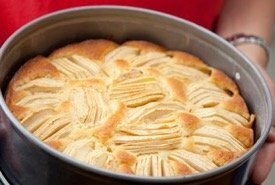 Mix and bake in a pie pan, pressing the cake until it is about one-quarter of an inch high. Before baking, sprinkle sugar and ground cinnamon on top; after it is baked, cut it into squares while it is yet warm. 8 ounces butter, 10 ounces flour, 1 ounce sugar, 4 ounces candied peel, rind and juice of 1 small lemon, 8 ounces sultana raisins, 5 eggs. Beat butter and sugar to a cream, add yolks of eggs, then flour and whites alternately, lastly, the fruit. Pour into buttered and papered cake tins, and bake two hours in moderate oven. The yolks of six eggs, five tablespoonfuls of flour, one of melted butter, one pint of milk, half a teaspoonful of salt. Beat the yolks of the eggs light, add the milk to them, and pour part of this mixture on the flour. Beat light and smooth; then add the remainder of the eggs and milk, and the salt and butter. Butter muffin pans, and half fill them with the cake batter. The quantities given will make twelve puffs. Bake twenty minutes in a quick oven. Serve on a hot platter with the orange dessert sauce (see below) poured over them. Nowadays, it's best to use pasteurized egg whites in non cooking recipes. The whites of six eggs, one cupful of powdered sugar, the juice of two oranges or of one lemon. After beating the whites to a stiff froth, gradually beat in the sugar, and then the juice of the fruit. Whisk the eggs in a basin and add to them the cloves, nutmeg, cinnamon, and castor sugar. Beat these well for about 10 minutes. Next add the peel, cut into thin but rather large pieces, the flour well dried, the almonds, blanched and cut into halves, and carbonate of soda mixed in a tablespoonsful of milk. Stir quickly and pour into a deep baking tin lined with butter, or, which is much better, wafer papers. Shake some more almonds on the top and bake in a moderate oven, three-quarters of an hour. When nearly done, sprinkle a little icing sugar on the top. This will keep well in a dry tin. For this German cake recipe, cream the butter, add sugar and the beaten-up yolks, and stir 3/4 hour. Then add the grated lemon peel and alternately the flour, and whisked whites of eggs. Roll out in three pieces and bake on buttered tins. Place the layers on each other, spreading jam between. Cream the butter and stir into it the beaten-up eggs, sugar, lemon juice, and grated lemon peel, and lastly add the flour, sifted, and mixed with baking powder. When thoroughly mixed, fill at once a well-buttered tin and bake 1 hour. Potato meal isn't often found for sale nowadays, but potato flour offers a good substitute, though it's a finer grind or texture. Different from potato starch, potato flour is a flour made from grinding dried, whole potatoes and is used as an alternative to wheat flour for gluten-free cooking. It helps to improve texture and add moisture and a natural sweetness when added to cookies and cakes. If potato flour is unavailable, twice the amount of instant potato flakes can be substituted with good taste results in recipes. For example, 2 ounces potato flour = 4 ounces potato flakes. Cream the butter, stir three-fourths of the flour into it and beat for 1/2 hour to a froth. In another basin beat, also to a froth, the sugar and yolks. Add the grated lemon peel and then the whites, whisked stiffly. Then mix with the beaten-up flour and butter and finally stir in lightly the well-washed and dried currants. Fill a well-buttered cake tin and bake 1 to 1-1/4 hours. Use these traditional German icings with the German cake recipes for an authentic taste. that end, the icing is squirted out at the pointed end of the bag, so that patterns of all sorts can be traced at will on the surface of Torten and other cakes. Warm the lemon juice and sugar in a saucepan till lukewarm. Then spread at once over the cake to be iced. White wine, rosewater, or fruit syrup may be substituted for the lemon juice. Blanch the almonds and grate them finely. Then mix them well with the sugar and rosewater, kneading well, so that the paste can be easily rolled out. Form into a ball and leave for some hours, before working up into various shapes or spreading, thinly rolled out, on Torten or Pfefferkuchen (recipes above). 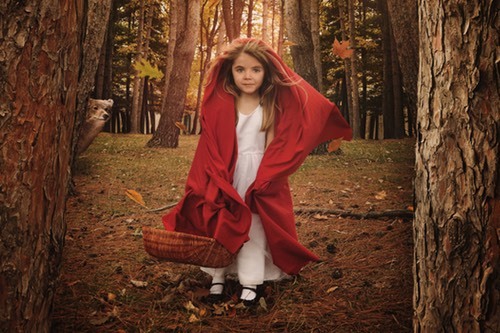 "One day her mother said to her: 'Come, Little Red Riding Hood, here is a piece of cake and a bottle of wine; take them to your grandmother, she is ill and weak, and they will do her good.'" The Brothers Grimm knew that a piece of German cake will do anyone good. It's the rich, all-natural ingredients called for in traditional German cake recipes and the unsurpassed Old World taste of these cakes making them perfect for serving to your loved ones on special occasions. Whether it's the German marble pound cake, the delicious konglauffe cake, or the simple hobelspane, your friends and family will love them. They're wonderful to have on hand, especially when company comes. And, these Old World cakes make perfect treats to enjoy anytime. I don't know about you, but I don't need a special occasion to enjoy eating a slice of homemade cake. Homemade always tastes better than store-bought!